Selbyana 5:321. 1981. TYPE: Panama. Code: La Mesa N of El Valle de Antón, ca. 2 km W of Cerro Pilon, on slopes of steep hill, disturbed virgin forest, 860-900 m, 21 July 1976, Croat 37373 (MO 2395383, holotype; B, CAS, F, GH, K, NY, PMA, SEL, US, VEN, W, isotypes; Live at MO). Usually epiphytic, frequently terrestrial, weakly rooted, 0.5-1.5 m tall; stem elongate, 30-75 cm long, 6-25 mm diam., dark olive green, minutely fissured, turning grayish green; internodes 1-5 cm long; roots few at each node, scaley; cataphylls moderately thin, 6-15 cm long, apiculate at apex, drying yellowish (B & K Yellow 9/2.5), remaining intact or weathering and soon deciduous. 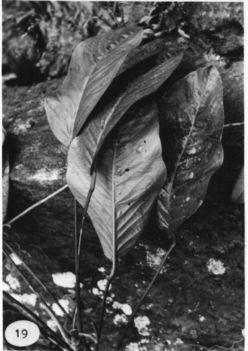 LEAVES with petioles (3-)5-57 cm long, 4-9 mm diam., terete to oval, flattened to bluntly sulcate near apex; geniculum 1.5-4 cm long, shaped like the petiole with sharper edges; blades oblong-oblanceolate to elliptic or ovate-elliptic, moderately thin, gradually long-acuminate at apex to abruptly acuminate (the acumen flat, acicular at apex, sometimes downtumed), obtuse to narrowly rounded or weakly lobed at base, (18-)28-51 cm long, (3-) 10-26 cm wide, broadest above the middle, the larger blades sometimes noticeably inequilateral with one side to 3 cm narrower than the other; both surfaces semiglossy; midrib obtuse at base above, becoming more acute, diminishing and sunken at apex, paler than surface, sharply raised below, paler than surface; primary lateral veins 6-16 per side, departing midrib at 40-50° angle, straight to arcuate-ascending to collective vein, sunken or weakly raised in valleys above, raised below; interprimary veins few, mostly continuous to the collective vein, sunken above, raised below; collective vein arising from one of the lowermost primary lateral veins, sometimes higher, mostly 3-10 mm from margin. 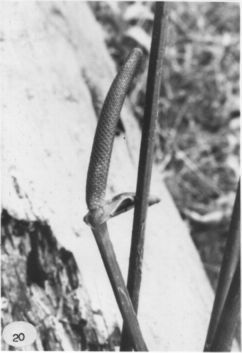 INFLORESCENCE spreading-erect, much shorter than leaves; peduncle 3-35(-50) cm long, 2.5-5 mm diam., subquadrangular, striate, flat to rounded adaxially, the ridges closer and more prominent abax-ially, one-fourth to one-half as long as petioles; spathe subcoriaceous, green (B & K Green 7/2.5 to Yellow-green 5/5) at anthesis, both spathe and peduncle sometimes heavily tinged with purple, usually reflexed, narrowly lanceolate to ovate-oblong, 1.5-7 cm long, 0.9-2.5 cm wide, broadest slightly below the middle, abruptly acuminate at apex, rounded at base, inserted at 45° angle on peduncle; stipe to 5 mm long; spadix green to dark green (B & K Yellow-green 5/7.5 to Green 5/5) at anthesis, 2-10.5 cm long, 3-7 mm diam. at base, 2-6 mm diam. at apex, flowers 4-lobed, 2-2.4 mm long, 2.4-2.8 mm wide, the sides jaggedly sigmoid, ca. 10 flowers visible in the principal spiral, ca. 7 flowers visible in the alternate spiral; tepals semiglossy, minutely papillate, darker along the outer margins, weakly punctate or epunctate, with scattered droplets, the lateral tepals 1-1.3 mm wide, the inner margins turned up against the pistil, the outer margin 3- or 4-sided; pistil emergent ca. 0.5 mm before anthesis; stigma round, minutely brush-like, with a minute droplet briefly apparent several days before first stamens emerge; stamens emerging one at a time in a scattered pattern beginning near the base, exserted 0.7-0.8 mm above the tepals; filaments fleshy, transparent, the exposed part longer than the anther, narrowly acute; anthers held erect, 0.4-0.5 mm long, 0.4-0.6 mm wide, pale yellow, widely spaced; thecae scarcely divaricate, oblong-elliptic, opening flat; pollen pale yellow (B & K Yellow 9/5) fading white. INFRUCTESCENCE spreading; spathe persisting, to 8 cm long; spadix to 15 cm long, 2 cm diam. ; berries ovoid, acute at apex, reddish becoming dark purple-violet, to 7.5 mm long, 5 mm wide; seeds 2, ovoid-ellipsoid, brown (B & K Yellow 4/2.5), weakly flattened, 3.2-3.8 mm long, 2.2-2.5 mm wide, 1.3-1.5 mm thick. Figs. 19, 20, and 22. The species is known only from central Panama at elevations of 500 to 1,100 m in regions of tropical wet and premontane rain forest. 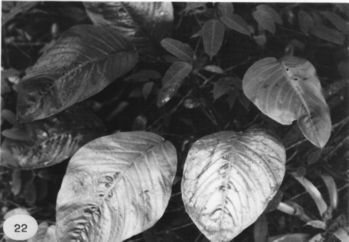 It is recognized by its erect, elongate stem, the oblong blades, broadest above the middle and usually narrowly rounded or subcordate at base, the short inflorescence with quadrangular or striate peduncles, and the greenish oblong spadix with pale yellow to whitish pollen. It is seemingly unrelated to any other species in Central America, and no South American relatives are known. It is tentatively placed in section Xialophyllium. Panama CoclŽ: 840-880 m, 08.38N 80.7.5W, 20 July 1990, M. H. Grayum & Randy Evans 9905 (MO). Panama CoclŽ: 775 m, 08.36N 80.07W, 25 March 1993, Thomas B. Croat 74788 (MO). Panama CoclŽ: 800 m, 08.39N 80.36W, 31 March 1993, Thomas B. Croat 75078 (MO, SCZ). Panama CoclŽ: 800-900 m, 8.38N 80.09W, 11 July 1987, Thomas B. Croat 67144 (MO). Panama CoclŽ: 850 m, 8.39N 80.36W, 13 Sept. 1987, Thomas B. Croat 67567 (MO). Panama CoclŽ: 89.39N 80.36W, 23 June 1988, Thomas B. Croat 68824 (MO). Panama CoclŽ: 800-900 m, 08.37N 80.07W, 11 July 1987, Gordon McPherson 11207 (MO). Panama CoclŽ: 800 m, 8.38N 80.17W, 16 Nov. 1983, H.W. Churchill 3893 (MO). Panama CoclŽ: 800 m, 8.38N 80.17W, 16 Nov. 1983, H.W. Churchill 3894 (MO). Panama CoclŽ: 800 m, 8.38N 80.17W, 16 Nov. 1983, H.W. Churchill 3895 (MO). Panama CoclŽ: 800 m, 8.38N 80.17W, 24 Nov. 1983, H.W. Churchill 3903 (MO). Panama CoclŽ: 900 m, 8.37N 80.06W, 25 Nov. 1985, G. de Nevers, A. Henderson, H. Herrera, G. McPherson & L. Brako 6347 (MO). Panama CoclŽ: 800 m, 08.36N 80.07W, 6 July 1994, Thomas B. Croat & Guanghua Zhu 76652 (AAU, CM, L, MEXU, MO, SAR, VEN, WIS). Panama CoclŽ: 860-900 m,, 21 July 1976, Thomas B. Croat 37373 (MO). Panama San Blas: 550 m, 9.44N 78.68W, 14 March 1985, Thomas B. Croat 60492 (MO). Colombia Valle del Cauca: Bajo Calima, 100 m, 03.59N 76.58W, 20 July 1984, Al Gentry & Myriam Monsalve 48400 (MO). Colombia Valle del Cauca: Bajo Calima, 100 m, 03.59N 76.58W, 20 July 1984, Al Gentry & Myriam Monsalve 48451 (MO). Colombia Valle del Cauca: Bajo Calima, 50 m, 03.59N 77.02W, 28 March 1986, Al Gentry, E. Zardini, M. Monsalve y J.D. Caicedo 53739 (MO). Colombia Valle del Cauca: 20 m,, 30 July 1997, Thomas B. Croat & John F. Gaskin 80611 .